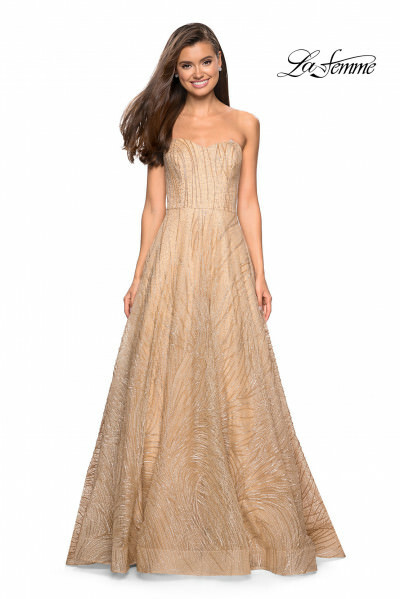 Rock your goddess look in a gold gown. On stage, gold shimmers and shines with and without sequins and sparkles. 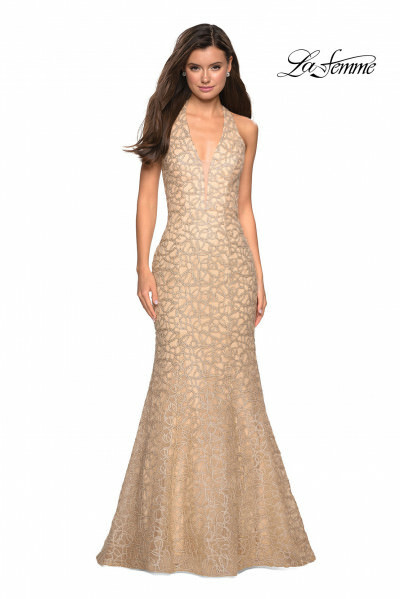 Gold prom dresses are elegant and glamorous in long flowing fabrics for dances and social events. A dress that needs few accessories to sparkle, gold is perfect for all occasions and events. Want a break from that little black dress for cocktail parties? Find a metallic above the knee short gold dress and outshine the rest. Gold cocktail dresses are perfect if you're looking for something fun and flirty for a homecoming, something mature and classic for a holiday party, or a bold statement piece to have as a staple in your closet. Wear gold at your wedding to be a contemporary bride and forget basic white or ivory. One of our gold ball gowns will catch every eye as young girl celebrates her fifteenth year at her quinceanera party. Flowing gold dresses will look flawless on sophomores and juniors. Want to go all out for senior year? A black and gold or gold and white evening dress in a fitted silhouette like mermaid or trumpet will blow everybody else out of the water with their contrasting color combinations. Pump up the wow factor with a stoned, beaded, or a sparkly sequin gold dress to catch light as you walk across the stage. You'll shine as bright as the crown you're sure to take home. Looking for a perfect dress for a Christmas party or holiday affair? Long sleeve gold formal dresses will catch the spirit of the season and make you look effortlessly festive without a cheesy Christmas sweater.